Damned if I can remember where this thing came from  Michigan, from the look of it. Someone probably sent me a copy. The interview, conducted in September of 1990, can be ... borderline ... incoherent ... at ... times. Bob Mould interested; Virgin was the only one that made sense as far as how much latitude they gave me. They're really good people. It's a good label. It's not as big as some of the established labels, but they have the clout, the distribution, the things that I'd like to have. You want people to understand what you're a bout. They are a big company, but not so big that you get lost. 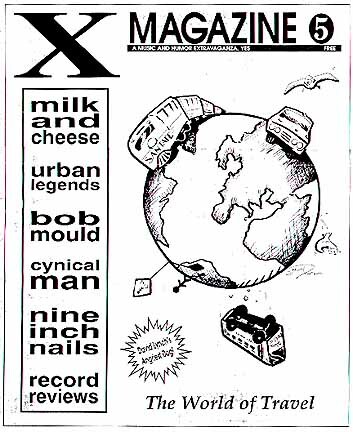 X: You played quite a few instruments with Husker Du. Were you one of those forced kids sat down to practice before you could go out and play? M: Not at all ... when I was about five, that was '65 or '66, my parents ran, and still run, a family grocery store and my dad used to get jukebox singles from a vending company after they pulled them off. So through '65 on to '68 I had this amazing collection of singles ... everything that you could imagine ... everything that was a pop single at the time ... I still have them all. That really got me into music. I was playing keyboards when I was really young. I didn't have a piano because money was tight, but I had one of those plastic organs ... just doing that and writing songs at eight and nine years old. So it's nothing new to me (laughs). It's one of the only things I've ever really enjoyed. X: How would you describe the maturing of your work? then you realize that you have a statement of intent put together. I think that's one of the things in the old days, a lot of the work of Husker Du was sort of rushed and the albums didn't have as much cohesion as they should have. It was such a quick turnaround ... songs were written just to keep records out, as opposed to writing songs and then sitting back and saying "this makes a good statement." X: So are you accomplishing everything in your music that you've wanted to? M: There's still a lot of things I want to do. I still get incredibly frustrated with my work. A lot of times I can't articulate things that I want to say. I think that's part of the whole thing. If it's ever perfect I think I'd stop. You always take the things that influence your life ... they soak into you and then you spit them back out ... you learn more about yourself. X: You prodiced Black Sheets of Rain. Do you feel more satisfaction and control in the end? M: Obviously, that was the main reason for ending Husker Du anyway ... after a while you get frustrated with compromising ideas, things that you don't think in your own mind are negotiable, but due to the politics of being in a band where everyone is supposed to be equal, you end up compromising things that you feel really strongly about. I'm sure it worked all the way around in that band. I'm sure it wasn't all my frustration. So now I can be a lot more focused. As with one person's vision, sometimes it can be a little more limited, which is something you have to be aware of when you're putting a record together. You try to have a number of perspectives so it's not completely an isolated thing. X: With all that's been going on, any new projects planned? M: Well, this one's been out for three weeks; it's been done since April of '90. I've got a lot of stuff that I've been working on since I've finished Black Sheets. I'm trying to see if the stuff is taking a direction. There's a lot of ideas that are all over the place. I usually take all of my work to the road and spend time with it. When it starts to take form and after the tour is done, it will be "time to make a statement" ... then it's time to make a record. Bob Mould was quite a rocker in his Husker Du days. Since the break-up, Bob has teamed up with drummer Anton Fier (Golden Palominos) and Tony Maimone (Pere Ubu) to complete Workbook and the newly-released Black Sheets of Rain. The Bob Mould band will tour the Northeast this fall. M: I like playing for people. The logistics of the road can be a little hard, a lot of traveling, not enough sleep, but I guess it's worth it to be able to play music. X: How does this tour compare with the last? M: Similar, but I think it's going to be a bigger tour in terms of venues and how many cities we're doing. It's also more suited for a live [reading] ... last year was a learning experience. Strting over with a new band, and a new attitude about things. There was a [past] that people compare everything to . Now with the second album, people are more apt to compare Black Sheets of Rain to Workbook than Bob Mould to Husker Du. It leaves me feeling a little bit better. Last year was a hurdle that had to be dealt with sooner or later. I think that things are back to normal ... playing music for people ... not having to apologize for anything any more. X: As far as the top 40 hit goes, ever plan on being a pop star? M: I know what you're saying, but I don't know what that would entail. I don't know what the criteria is for being a pop star, so I don't think it's possible.... I would love to have songs on the radio, but whether that qualifies for selling out or not, I'm not sure. I try to please myself. I try to do work that I think is good, that I feel says something. To try to write music that would be successful would be a complete failure. Nobody can predict what's going to be successful. farm for a year and a half from right before when the band broke up to writing the Workbook album was an experience. Just sort of the blending type of ordeal where you extract yourself from your situation that you've been in repeatedly, and then change it completely. You can really get more in touch with who you are as a person. I think Workbook reflected that. After that record I was moving around a lot, now I'm living in Manhattan. I never thought I was going to end up here. I think being out here for a year has a lot to do with why Black Sheets turned out the way it did. Not only all the touring and the reactions from people, but seeing what the audience appreciated and bringing that home in January. I did a lot of writing ... it worked really good ... this record was really a lot more spontaneous. X: The last two Husker Du albums were on Warner Brothers. Any reason for the change to Virgin? M: To be cold and factual about it: when I left the band there was options presented. One was for me to be replaced and Husker Du to continue on Warner Bros. There was the option for me to stay on Warner Bros. as a solo artist or to terminate the contract completely ... obviously the third was chosen ... not for any other reason I think than that it was the best way to go. At the time I had no interest in making a record nor being involved in music in a public sense. X: So Virgin just picked you up?